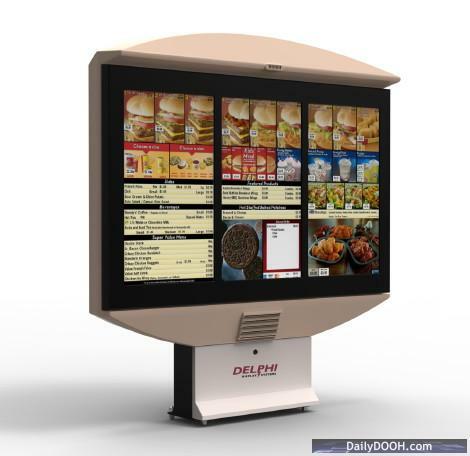 Delphi Display Systems Inc. of Costa Mesa, California, is introducing what management says is the first fully integrated digital menu board system designed from the ground up to meet the harsh environmental demands of the Quick Service Restaurant drive-thru. Delphi has developed a full line of rugged outdoor digital menu boards that include single, dual and triple 46″ screen versions. The underlying technology uses high-brightness, sunlight- readable LCD technology integrated into a sealed NEMA4/IP65 rated enclosure system. The integrated environmental management system allows the digital menu board to operate reliably from -40°F to +126°F with direct exposure to sunlight, wind, rain, snow and dust. They are IP65 sealed units so that they can withstand any hard environmental conditions. Delphi’s new digital menu board products integrate embedded microphones, speakers and digital cameras to provide drive-thru order confirmation capability, eliminating the need for separate speaker post or order confirmation display. In direct sunlight, large format high-bright digital displays generate significant heat. Without proper cooling and monitoring, system failure can rise dramatically – resulting in increased repair cost and downtime for the restaurant operator. Delphi’s proprietary Environmental Management System uses active cooling and heating technology coupled with integrated component level diagnostic capability to allow for remote fault detection and isolation. 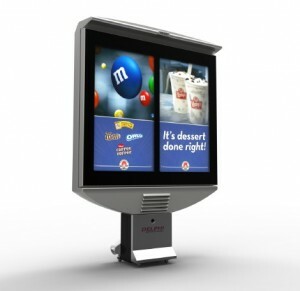 The 24/7 operational requirements of outdoor digital menu boards put a strain on even the most robust electronic components. Delphi’s design minimizes the risk of failure by integrating independent redundant power systems and video processing units that provide for safe fail-over operation in the event of a component failure. 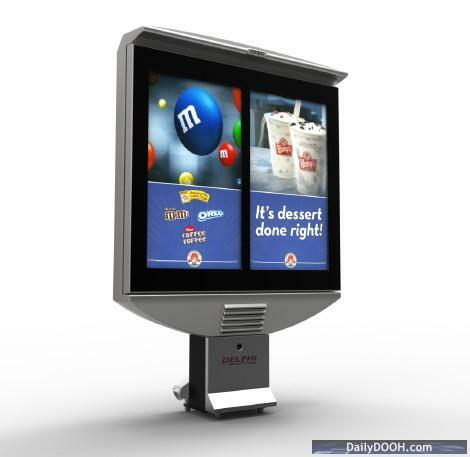 This entry was posted on Thursday, March 3rd, 2011 at 10:00 @458 and is filed under DailyDOOH Update. You can follow any responses to this entry through the RSS 2.0 feed. You can leave a response, or trackback from your own site.